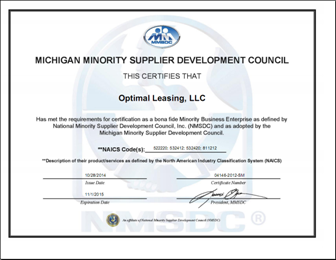 Optimal Leasing LLC is an approved Minority Business Enterprise (MBE) certified through the Michigan Minority Supplier Development Council (MMSDC) the largest certification body for Minority Business Enterprises in the United States. Optimal Leasing LLC has gone through a fairly complex process to become certified. In the process of being certified the company was said to "have presented the best organized package ever seen" according to the Director of Minority Certification for MMSDC. Certifications are obtained through a variety of local, state, regional and government entities. There are approximately 31 council organizations not including the United States Small Business Association that provides minority certification. If a company has a desire to become a certified MBE they will register with the certification body that represents their state. If there is no certification body or council that represents your state then a company can apply for certification through National Minority Supplier Development Council in New York (NMSDC). Companies desirous of obtaining government certification and applying for certification as a Small Development Business (SDB) they can apply through the Small Business Administration. Optimal Leasing LLC has initiated the process to become recognized as an SDB also. Corporations who work with MBE companies provides many benefits both at the city and state level. In order for a company to qualify as an MBE they must at least be owned by a woman, African American, Native American or other minority group. 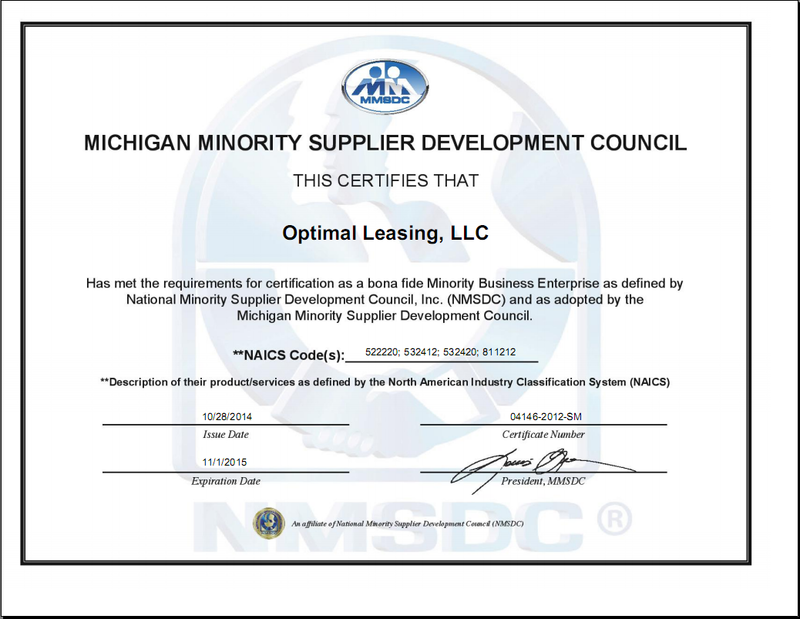 Optimal Leasing LLC is 100% African American owned company (see approved certificate on this page). MBE companies are often at a disadvantage compared to their competitors because of many factors. One primary disadvantage is access to capital. However, there are other factors, such as, lack of education and lack of professional training. By obtaining a minority certification designation MBE's are provided with an opportunity to break through these barriers. When compared to their contemporaries it has been found that minority companies receive only half the dollars earned by companies similar in size that represent non-minority companies according to the Urban Institute. One reason for the disparity seems to be the location of their businesses. Evidence proves that many communities are still segregated. Therefore, when businesses contract with MBEs in segregated communities this has proven to be good for the community as the dollars spent by the minorities are often put back into the communities in which they work and live. For example: Rush Trucking located in one of Detroit's empowerment zones has been able to create jobs for more than 2000 workers. Such an initiative is a great example for why corporate businesses should contract with minority businesses. In many cases MBE companies can provide quality services to corporation which have diversity spend objectives resulting in a WIN-WIN situation for both parties. Optimal Leasing LLC understands the value proposition that it can provide to its customers who have projected MBE spend goals. There are several corporations who actually have set aside contracts for minority companies. When such awards are awarded to MBEs from the corporate or government sector this can prove to be a tremendous benefit to the MBE in fostering the growth of an MBE. Optimal Leasing LLC has been able to take advantage of its certification in opening several doors in the corporate world. Many organizations that have MBE objectives have complained that they have problems finding qualified MBEs that are sustainable and can deliver quality services on time. However, this can not be said of Optimal Leasing LLC whose leadership is under the experience of a leader who has 30 years plus in providing on-time quality financing platforms for the fortune 100 company to the startup. Discover the better choice and choose certified MBE that understands your business, Optimal Leasing LLC. An MBE certified company that counts!